Calvin Coolidge John W. Davis Robert M. La Follette, Sr. 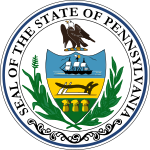 The 1924 United States presidential election in Pennsylvania took place on November 4, 1924. Voters chose 38 representatives, or electors to the Electoral College, who voted for president and vice president. Pennsylvania overwhelmingly voted for the Republican nominee, President Calvin Coolidge, over the Democratic nominee, former United States Ambassador to the United Kingdom John W. Davis. Coolidge won Pennsylvania by a landslide margin of 46.26 percent. Coolidge was credited for the booming economy while the Democratic electorate was divided between the conservative Davis and the liberal third-party candidate Robert La Follette who ran as a Progressive. This was the first presidential election in which all American Indians were citizens and thus allowed to vote. With 65.34% of the popular vote, Pennsylvania would prove to be Coolidge's fourth strongest state in the 1924 election in terms of popular vote percentage after Vermont, Michigan and Maine. ^ a b c Pennsylvania La Follette vote was the fusion of Socialist and Labor parties. ^ a b c d e f g h i In this county where Davis ran third behind Coolidge and La Follette, margin given is Coolidge vote minus La Follette vote and percentage margin Coolidge percentage minus La Follette percentage. ^ "1924 Presidential Election Statistics". Dave Leip’s Atlas of U.S. Presidential Elections. Retrieved 2018-03-05. ^ "1924 Presidential General Election Results – Pennsylvania". Dave Leip’s U.S. Election Atlas. Retrieved 2018-03-17. This page was last edited on 30 December 2018, at 01:22 (UTC).